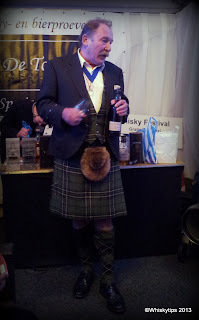 The Whiskyfestival Noord-Nederland (North Netherlands) took place from the 22nd to the 24th of March 2013 in the lovely city of Groningen. Venue was the Der Aakerk, a medieval churchbuilding, right in the citycenter. Around 5,000 enthusiastic whiskyfans visited this 8th edition of the festival. Allthough it seemed slightly more crowded than last year's edition, it is still an easy going festival. This festival attracts a wide variety of whiskydrinkers. For people who are just getting introduced to the world of distilled grain spirit, the festival offers a wide arrange of drams to choose from. And this for an entrance fee of €25,-. For the more experienced whisky-enthusiast there's a variety of options. Numbers of masterclasses, a special whiskydinner on the night before the start of the festival at the Prinsenhof and lots of rare whiskies to choose from, for just a few euro extra. As you can see in the video, besides drinks the festival has a lot of other things to offer, like great cheese, chocolates and all kinds and clothing. What we really can recommend is the VIP-option. For a price of €85 you have admission to the festival with a few extras. One of them is that you don't have to stand in line in or out, no waiting for your jacket and some really rare drams to try. A bonus is the nice food that is being served with the drams, all prepared by Inge Lanckacker, a great chef from Gand, Belgium who is specialised in cooking with whisky. But, the greatest bonus is the chance to meet the rock and roll stars of the whisky trade, who come to the VIP-tent after finishing their masterclasses and present a special dram in a relaxed mood. People like Ad de Koning, Hans Offringa, Martine Nouet, Gordon Muir and Charles Maclean, they were all there. All in all another great event, a big hand to all the volunteers who helped turning this festival into a success. Kleine correctie: het voedsel is bereid door Inge Lanckacker, Belgische chef uit Gent, specialist in het koken van gerechten in combinatie met whiskey.